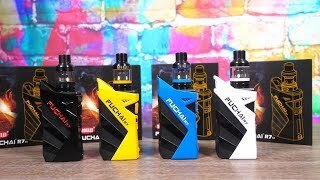 If you're a fan of the aesthetics, the Fuchai R7 gets a solid recommendation, especially for vapers who are in need of a reliable and well built high-powered mod. The high wattage output makes it a great partner for sub-ohm tanks and larger RDAs with diameters of 24mm or more, cementing its capabilities as an impressive cloud and flavor machine. Sigelei is one of the oldest names in the vaping biz and their Fuchai series of mods has become practically a household name for vapers. 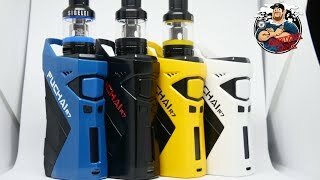 Given that it's not surprising that they're extending the lineup even further with the release of the Fuchai R7. Packing an impressive 230 watts of power underneath the hood, the Fuchai R7 is powered by dual 18650 batteries that promise a healthy battery life for long-term vaping. Packed into a futuristic, almost avant-garde chassis, the Fuchai R7 is a definite head-turner, but does it perform where needed? Let's check out the details of the device in the review down below. Despite the seemingly edgy design of the Fuchai R7, it's surprisingly ergonomic. The sharp lines and geometric patterns plastered throughout the facade of the device are merely just that, a facade. Upon closer inspection, it becomes evident that every corner, every edge of the Fuchai R7 has been smoothed out and contoured which allows for a much more comfortable grip when held in hand. The zinc alloy construction feels nice and premium to the touch and adds a considerable amount of heft to the device giving you an impression that this isn't a mod that needs to be babied by any means. The paint finish, available in black, white, yellow, and blue is also well done, capable of standing up to the rigors of daily use with minimal scratching, flaking or chipping even with rough use. Utilizing a 0.91 inch OLED display, information shown on the screen is crisp and clear and is even easily legible when viewed under direct sunlight. The UI is both informative and intuitive giving basic starter kits a run for their money with the incredibly easy to use layout. The firing button doesn't feel flimsy one bit and gives off a satisfying and resounding click when pressed without any annoying wriggling or rattling which is a common symptom of lower quality devices. Sigelei didn't scrimp on the internals of the Fuchai R7 either. Aside from the massive 230-watt output available through the device's standard variable wattage mode, the R7 is also quite capable of vaping with temperature control coils with support for stainless steel, nickel, and titanium coils. As for temperature control accuracy, it's hard to find anything to complain about with the performance in TC mode even rivaling that of more expensive DNA devices. If that wasn't enough, support for customizable TCR ratios is also available for tweaking with the Fuchai R7, giving more nit-picky vapers a great outlet for dialing in the exact settings of their vaping experience. If you're a fan of the aesthetics, the Fuchai R7 gets a solid recommendation, especially for vapers who are in need of a reliable and well built high-powered mod. The high wattage output makes it a great partner for sub-ohm tanks and larger RDAs with diameters of 24mm or more, cementing its capabilities as an impressive cloud and flavor machine. The durable paint finish on the exterior is also sure to stand the test of time so you won't have to worry about the Fuchai R7 looking like it survived a nuclear apocalypse only within a few months of use.